I don't like to brag, it makes me feel awkward, but today I received the so much awaited email from Microsoft announcing my renewal of the MVP Award for Dynamics AX. I feel like I've been holding my breath for the last weeks and trying not to get my hopes too high. I am humble and thankful for the Award and the support by the AX community, fellow MVPs and Microsoft employees. From the bottom of my heart, THANK YOU! The last year has been increasingly interesting and fun, and at times perhaps a bit exhausting. The number of requests from AX professionals have increased and I try my best to give valuable answers to those who reach out. I love to share the knowledge and my passion for Dynamics AX, and I do have high hopes for Dynamics AX as a great platform for building the best ERP solution out there. A lot of the AX giants out there have been extremely valuable for me when I've been searching forums and blogs for AX content. Being an MVP has made it a lot easier to get to know more people who share the same passion and glow for AX. The AX community is still growing at a fast pace, and all the time new amazing professionals are discovering Dynamics AX, which is great. This makes me humble for having the pleasure of getting this Award, and I probably can't emphasize that enough. I aim to keep pushing what I hope is valuable content to the community, and if you also have a sharing mentality, you should consider create a site or blog and share. 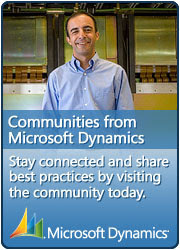 At least join our Dynamics AX Community Site.